BLASTING 48 E&MJ • APRIL 2018 www.e-mj.com easiest answer is that there was a hard seam "that needed more energy" or the joint set caused the explosive to malfunc- tion. Highly unlikely. The more common cause for this is that the explosive was not placed to a proper depth. This can be for numerous reasons: • The driller did not reach proper depth leaving a short borehole; • The hole slumped (material fell back into the borehole) causing a shorter borehole; • The drill hole was not aligned properly leaving a large toe burden (can be on first row or on an internal row); • Small amount of water in the bottom of a borehole desensitized ANFO in the toe; and • Improper gassing of emulsion as new hole was started. Before a geologic problem can be blamed, all these must be checked to ensure that none of these caused the issue. Only after these have been ana- lyzed can one begin to blame geology, but these can't be analyzed after the event has occurred due to the nature of blasting. Instead, consistent data collec- tion must occur during the drilling and blasting process to ensure that these errors do not happen. The first step of the process improvement is minimizing these errors, which is typically done through training and setting up proce- dures to ensure these errors cannot be made or their impact has minimal effect on the operation. After both an appropriate initial design is obtained and the errors are minimized, the second stage of process improvement is to begin to look at optimizing the de- sign for the specific site. For example, it is typical that on a 20-foot (6 meter) bur- den, there must be at least 120 millisec- ond (ms) delays between rows firing (as- sume that the material is not being cast). 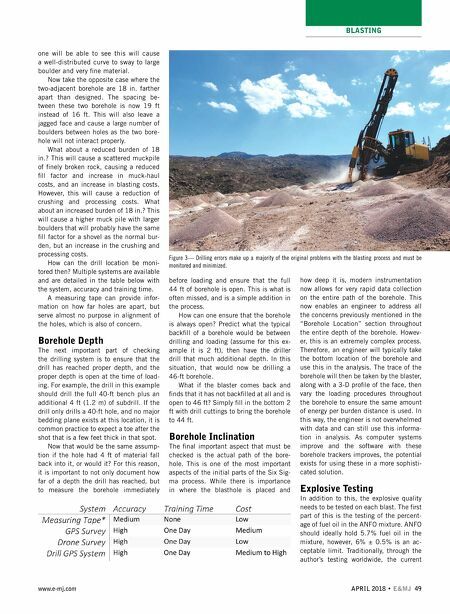 Perhaps for that specific site's geology and firing pattern, really 175 ms between rows gives the optimum fragmentation and muck pile placement for minimizing costs through the mine. 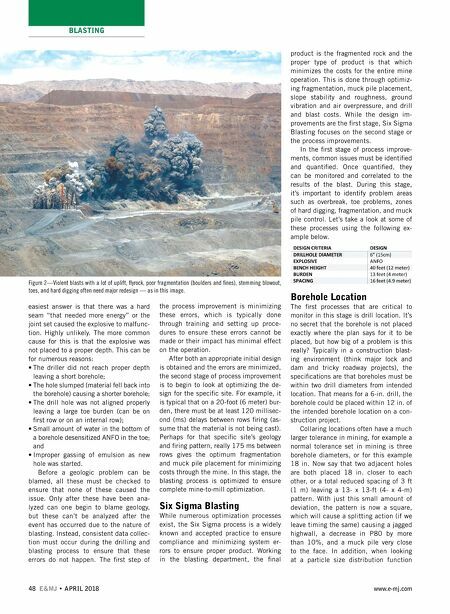 In this stage, the blasting process is optimized to ensure complete mine-to-mill optimization. Six Sigma Blasting While numerous optimization processes exist, the Six Sigma process is a widely known and accepted practice to ensure compliance and minimizing system er- rors to ensure proper product. Working in the blasting department, the final product is the fragmented rock and the proper type of product is that which minimizes the costs for the entire mine operation. This is done through optimiz- ing fragmentation, muck pile placement, slope stability and roughness, ground vibration and air overpressure, and drill and blast costs. While the design im- provements are the first stage, Six Sigma Blasting focuses on the second stage or the process improvements. In the first stage of process improve- ments, common issues must be identified and quantified. Once quantified, they can be monitored and correlated to the results of the blast. During this stage, it's important to identify problem areas such as overbreak, toe problems, zones of hard digging, fragmentation, and muck pile control. Let's take a look at some of these processes using the following ex- ample below. Borehole Location The first processes that are critical to monitor in this stage is drill location. It's no secret that the borehole is not placed exactly where the plan says for it to be placed, but how big of a problem is this really? Typically in a construction blast- ing environment (think major lock and dam and tricky roadway projects), the specifications are that boreholes must be within two drill diameters from intended location. That means for a 6-in. drill, the borehole could be placed within 12 in. of the intended borehole location on a con- struction project. Collaring locations often have a much larger tolerance in mining, for example a normal tolerance set in mining is three borehole diameters, or for this example 18 in. Now say that two adjacent holes are both placed 18 in. closer to each other, or a total reduced spacing of 3 ft (1 m) leaving a 13- x 13-ft (4- x 4-m) pattern. With just this small amount of deviation, the pattern is now a square, which will cause a splitting action (if we leave timing the same) causing a jagged highwall, a decrease in P80 by more than 10%, and a muck pile very close to the face. In addition, when looking at a particle size distribution function Figure 2—Violent blasts with a lot of uplift, flyrock, poor fragmentation (boulders and fines), stemming blowout, toes, and hard digging often need major redesign — as in this image.